To Absolve or Not to Absolve? May Almighty God have mercy on us, forgive us our sins, and bring us to eternal life. My short response is that even though it looks as if both traditions are doing the same – we are not. And the semblance is reinforced by having it in the same place in the service. And using the word “absolution” is also not helping. Then the priest invites those present to take part in the Act of Penitence, which, after a brief pause for silence, the entire community carries out through a formula of general confession. The rite concludes with the priest’s absolution, which, however, lacks the efficacy of the Sacrament of Penance. The RC priest makes no Sign of the Cross over the congregation (as Anglicans are wont to do). I hope the penny is dropping: for RCs, this point in the rite is not sacramental absolution. It is a petition asking for forgiveness. Misereátur tui, omnípotens Deus, et, dimíssis peccátis tuis, perdúcat te ad vitam aetérnam. The server is NOT absolving the priest! This is – let us stress again – a petition asking for forgiveness. RCs only give a General Absolution in case of emergency, eg. soldiers going into a war zone, but, after this, they must go to confession as soon as possible. Anglicans are not requesting forgiveness; Anglicans are absolving – using the subjunctive [God forgive you… God pardon you…]. I have long argued that Anglican absolution in the liturgy needs a serious rethink. To put the problem in its baldest form: Anglicans absolve candidates for baptism prior to baptising them. Baptism, hence, appears to be plundered of its power to forgive sin! Anglicans absolve the sins of a baptismal candidate so that this candidate is worthy to receive the sacrament of baptism!!! Once you see this, you see that Anglicans do not celebrate Eucharist and receive communion “for the forgiveness of sins” – Anglicans forgive sins so that people are worthy to celebrate Eucharist and receive communion. In this paradigm, the theological conundrum is inevitably generated: to forgive sin, why did Christ need to become incarnate, suffer, and die when all that is needed is a verbal, subjunctive absolving statement with or without arm waving? The Anglican clergy mentioned above, who change the Anglican formulas from “you” to “us”, solve none of these problems. They are still pronouncing a general absolution, in the subjunctive mood, but simply including themselves more explicitly for those who cannot recognise their inclusion in the authorised words. The sacrament of baptism cleanses from sin and initiates a lifelong process of repentance and forgiveness. The Eucharist is a dimension of this process, renewing the baptismal covenant, and mediating Christ’s sacrifice “for the forgiveness of sins.” This rich understanding of the Eucharist meant that for most of the church’s history there was no verbal confession and absolution within the eucharistic liturgy. The whole eucharistic action was seen to be reconciling. Penitential practices from private medieval piety, however, were embodied into the first Anglican Prayer Book in 1549 and have shaped Anglican piety to this day. Modern liturgical renewal is rediscovering the earlier insight that “as we take part, as we break bread and share the cup, our forgiveness is renewed and we are cleansed” (page 403). A Form for Ordering the Eucharist (pages 511 ff.) makes clear that verbal confession and absolution is not an essential element of the eucharistic liturgy. Anglican eucharistic revisions in the United States of America, Canada, and elsewhere, have highlighted this rediscovery by making confession and absolution optional within their revised rites. This in no way diminishes sin, its gravity, or the necessity of repentance. What is being taken more seriously is that penitential elements may be included in the Prayers of the People, and be sincerely expressed in the Peace and the Lord’s Prayer. Reconciliation is also celebrated in the breaking of the bread, receiving communion, and so on. Verbal confession and absolution is only one way in which, on particular occasions, reconciliation may be expressed. Instagram’s @liturgy is the new venture – if you are on Instagram, please follow @liturgy. 13 Responses to To Absolve or Not to Absolve? Interesting post. The difference here surely goes all the way down. Article 25 of 39 pointing out in 1552 what you have (in response to your questioner) pointed out in 2019. As is you often say education here is the key. Reading Article 26, tis a good thing marriage, along with penance, has been removed from the list of scaraments, for Good King Henry would have been in the gun had it not. So why not ditch altogether? Jesus’ call to repent and believe (St Mark 1:15) was about a change of attitude toward, and repudiation of, sin (metanoeo). As the Eucharistic rite builds I find it personally helpful to be reminded of this commandment. So often we tend to the love God, love thy neighbour commands, but if we love the Lord and keep his commandments (St John 14:15) then this changed attitude, and repentence is dominical having been commanded as much as “do this to remember me”. As the eucharist for Anglicans is the visible sign of the invisible Kingdom…a kingdom of total and complete reconciliation, then is it possible to see the general confession and assurance of absolution (including arm waving to remind us by whom and through whom this is achieved) as a significant part of the eucharist? And depending on your answer to above, as you suggest some, myself included, might see it as a desirable (integral? )component of preparing to receive sacramentally Christ and all that entails. Add on. And in this metanoeo, do we not go a way toward loving God and our neighbour? (In case my place amidst the love brigade was in doubt). The 1662 Latin Book of Common Prayer gives the absolution at communion as follows: “… Misereatur vestri, et dimittat vobis omnia peccata vestra: …” In other words, exactly the same subjunctive word “Misereatur” as in the traditional Roman rite you cite. The 1662 English translation of this jussive subjunctive doesn’t include the word “may”… but that is a good translation. As another example “fiat lux” can be translated “let there be light”– it is performative language, not a tentative or uncertain petition. I think the modern style is to use the word “may” more, as in the modern Roman translations, and indeed many modern absolutions in the Church of England’s Common Worship. I don’t think we can read too much into whether or not “may” is used in the translation, i.e. “may” might be used or left out more for reasons of style than a qualitative difference in what is going on. I would argue that the absolution in the Anglican liturgy is *not* the same thing as the absolution in auricular confession (just as it is not the same thing for RCs). 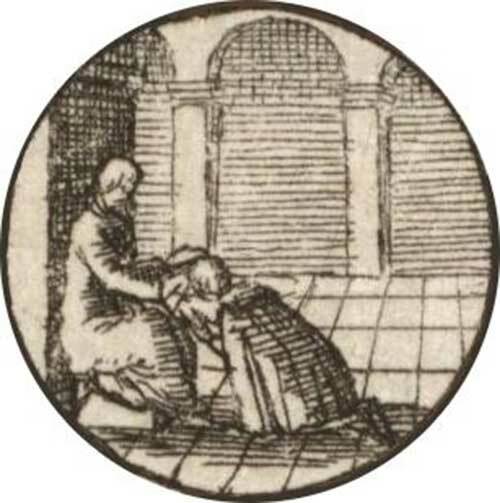 For example, the first exhortation in the 1662 rite tells penitents to come to confession if they cannot quiet their conscience by the General Absolution in the Communion Liturgy. They are obviously seeking absolution (in the form “I absolve you…”) from sins for which they have already received “absolution” in the Communion Liturgy in the jussive subjunctive form “God… forgive you”. The usual practice of those who go to confession supports this: one confesses serious sins since one’s last confession, not since the last time one heard the priest’s general absolution in a public liturgy. Thanks so much for that analysis, Russell. I have also now checked the Latin of the Missale Romanum Editio Typica Tertia Emendata 2008, and it also has “Misereatur” – aligning (formal/official) RC and Anglican understanding at this point more than I had realised. An issue continues: the use (in NZ Anglican practice at least) of this normally prior to baptism. Another comment (to follow) highlights that there are other Anglican approaches (eg The Episcopal Church) where absolution is not pronounced prior to baptism. I also need to check what happens in the RC Church when baptism is celebrated in the context of the Eucharist. Blessings. Where in the BCP 79 is the candidate absolved before being baptized? Readers here can find what Chip is talking about in their copy of The Episcopal Church’s BCP online. I have now also checked the CofE version (Common Worship). What interests me, in this conversation, is that if baptism is celebrated there in the context of the Eucharist (the normal practice in NZ Anglicanism) the CofE instructs “The Prayers of Penitence and the Nicene Creed are omitted”. I am now wondering which other Anglican provinces are like NZ’s – absolving before baptism. For this English Anglican I had understood the absence of auricular confession widely in the CofE to be due to the General Confession and absolution given by the priest. The use of the words either you or us are not interchangeable, particularly if it is a service of the word, led by a Lay Minister such as me. I am specifically forbidden to use the word you, as I am not a priest. When I lead Evensong or Communion by Extension, I use the alternative collect for the 21st Sunday after Trinity in the BCP. I was aware of the forgiveness for our sins in the Eucharist, but you have given me additional insights into how it works. Thank You. Thanks, Ernie. I think the reminder that a lay person cannot use the “you” form in Anglicanism is a very helpful addition to the discussion developing in this thread. Blessings. Various comments above make some points I made to you via Twitter (one of the many “via (social) media” available to us today!). One point not made is that, in my experience across our diverse ACANZP, the substitution of “us” for “you” by a priest otherwise authorised to address “you” is not imitative of Rome but (I surmise) a reluctance – evangelical/low church in context – to distinguish priest (by office) from priest of the kingdom (i.e. congregation). On the other hand, in an evangelical provenance, there is also an important discussion about whether the authority of Jesus himself, via plain Scripture, is sufficient authority or not for an ordained priest/presbyter or bishop/overseer to pronounce absolution as though the unmediated voice of God to the congregation (i.e. as the Spirit speaking through the bishop/presbyter to the church). Thanks for repeating that point here, Peter. There are often good points made on social media, and I don’t know how we can link such discussions together. Your point is magnified in the absolution in the NZ Prayer Book in the rite for Private Confession where the priest or bishop says, “I absolve you from your sins.” One thing comes from this discussion: the need to survey Anglican provinces to see if we are an exception in (normally) absolving at the start of the service in which baptism occurs. I know that this is not a requirement here, but I would say it is (usually) done without the reflection pointed to in this discussion. Blessings. In my understanding this is okay because it simply communicates and hands over to people the grave already given in baptism — the grace given in fact to all people on the cross and claimed by faith. So, for us, all the sacraments, the absolution (general and particular) and the sermon all do the same thing: They Hand over the goods of Christ’s grace to sinners. Puzzlingly, though, the Ash Wednesday liturgy in our newest hymnal (Evangelical Lutheran Worship for US Americans) gives only a conditional absolution after the litany if confession. Huh. Thanks, Robin, for this comparison. So if you have a baptism, do you have it after this full absolution – so that the candidate for baptism is first absolved before being baptised? Blessings.